Even though prices of real estate are steadily increasing in all segments of the real estate market in the Czech Republic (i.e. residential, commercial, industrial), it is still possible to find opportunities for investments with prospect of solid yields in the following years. There was a huge increase of investments to commercial real estate on the Czech real estate market in 1Q and 2Q of 2017 in amount of EUR 2.2 billion. Vacancy of premises for office lease continued to decline and for the first time since Q4 2008 dropped below 10%, namely 8.6% in 2Q of 2017. Strong demand from tenants contributed to a year-on-year increase in net volume of rentals by 11%. Regarding industrial segment of real estate, low rate of speculative construction and strong demand from the tenants continues maintains free premises for lease at a low level, namely 4.1% in 2Q 2017. Lack of vacant stock ready for immediate occupancy is a limiting factor for larger occupiers. Despite this new office space completing in 2017 being a fair amount higher than what was experienced during the past 18 months, analytics expect the current levels of occupier demand to keep the vacancy rate below the 10% level. With respect to industrial segment, premises totalling 575,000 sq m were under construction across the country at the end of Q2 of 2017. Speculative development accounts for 40% of this figure, which equates to some 11 new large industrial units coming to the market by Q1 2018. However, the lack of permitted industrial land continues to limit the number of opportunities for developers and occupiers. 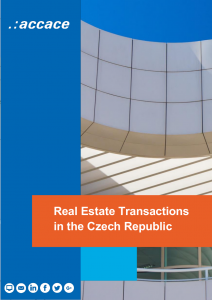 For a better orientation on the real estate market, we bring you this brief overview with information on legal aspects related to real estate transactions in the Czech Republic. There are currently no general limitations on ownership or occupation of real estate by foreign entities or foreign citizens and this applies to foreign guarantees and security as well. However, specific limitations can follow from economic sanctions imposed by the EU, United Nations or other international organisations of which the Czech Republic is a member. The real estate market in the Czech Republic can be quite confusing for a new investor. As of 1 January 2014, when the new Civil Code came into force, buildings form part of the land on which they are located. This means that buildings are usually owned by the owner of the land. Buildings also cannot be transferred independently from the land (principle “superficies solo cedit”). This applies to the buildings constructed after 1 January 2014 and to the buildings which had the same owner as the land under the building on 31 December 2013. As always, there are some exceptions to this general rule. But let´s focus on the big picture. Buildings constructed before 1 January 2014 can be considered as a separate real estate itself. Such a building will remain a separate real estate until it is owned by the same entity as the land under the building. It has to be pointed out, that for the purpose of a merger of a building with the land under the building, both the owners have a mutual statutory pre-emptive right, which means the owner of the land has a pre-emptive right to the building and vice-versa. It is also possible to construct a building on another person’s land (without acquiring the land). This can be arranged by a right to build. Right to build is considered as a separate real estate in a legal sense and as such can be transferred or mortgaged. On the other hand, the building itself is not a separate thing and only forms part of the right to build. All the information on real estate can be found in the Cadastre of Real Estate administered by the State Administration of Land Surveying and Cadastre. Real estate in the Czech Republic (again with certain exceptions such as engineering networks) and certain rights to it are registered in Cadastre of Real Estate. This information is listed for each cadastral area on separate title deed. Such a deed lists all the information on all the real estate owned by the same person in relevant cadastral area. Furthermore, the Cadastre of Real Estate includes the Collection of Deeds which contains documents relevant for the registrations in the register (such as past acquisition titles to real estate or geometric plans). The descriptive information as well as excerpts from the individual title deed can be obtained for a fee electronically via the website of the State Administration of Land Surveying and Cadastre (http://katastr.cuzk.cz). The Civil Code states that if a person acquires a real estate from the person registered in the Cadastre of Real Estate for a consideration and in good faith, then the ownership to the real estate is acquired even if the registered person has not been the legal owner of the real estate. If the relevant Cadastral Office makes an error during a registration in the Cadastre of Real Estate, only a compensation for related damages can be claimed. acquisition of shares in the company holding the real estate (share deal). Acquisition of shares can be preferred due to tax reasons, as direct transfers of real estate are subject to the real estate transfer tax. The disadvantage of share deals is that the investor acquires not only the relevant assets, but all the company’s liabilities as well. This is sometimes mitigated by corporate demerger, where the relevant asset is demerged to a newly established clean company that is subsequently the subject of the share deal. With an asset deals, real estate is transferred on the registration of the purchase agreement in the Real Estate Register. The registration is performed on the basis of an application signed by either party to the purchase agreement, accompanied by an original or certified copy of the agreement. The registration is subject to a fee, currently CZK 1,000. The registration proceedings take about one month, provided that the ownership is then transferred retroactively from the date of the filing of the application. Because of an over 40-year period of communism in the Czech Republic, a kind of settlement of injustices made during these times has been implemented into the Czech law. The so-called restitution of Real Estate property in the Czech Republic is bound to the property unlawfully escheated by the Communist regime in the 1945-1989 period. Restitutions are mainly governed by the so-called restitution acts. The restitution process is not over yet in the Czech Republic and, currently, so-called church restitutions are ongoing. Due to the various restitutions, it is necessary for investors to check thoroughly the legal status of the intended acquisition from the point of being potentially the object of restitution at the Czech State Land Office. 75 % of the value of the real estate determined by a chartered valuer. However, in certain cases, a different tax base can be used. corporate income tax at a rate of 5 % (if the seller is a licensed real estate investment fund). The most important public regulation for preparation and realization of constructions in the Czech Republic is the Czech Building Act and its associated and implementing legislation. For realization of a construction, a permit from the Building Office shall be obtained; for simple constructions only a notification to the Building Office is needed. The permitting procedure, basically, consists of two phases. Firstly, a developer is obliged to obtain a land-use permit containing conditions on location of the building. The land-use permit is issued by the Building Office if the location of construction meets general criteria stipulated by law and specific criteria specified in the land-use plan issued by the municipality. After obtaining the land-use permit, the developer submits an application to the Building Office for a building permit. Applications for both the land-use and building permit contain, apart from general essentials, the basic data on the required project and the grounds’ and building objects’ identification data. The developer has to attach documents proving its rights to the land entitling it to realize the construction, project documentation, control plan, binding assessments requested by a special regulation, e.g. environmental and health protection, fire protection, and opinion of owners of the public transportation infrastructure and utilities if the construction is connected to the infrastructure. For larger projects, the environmental impact assessment procedure (EIA) is needed. The Building Office is obliged to issue a land-use permit as well as a building permit without undue delay. After successful realization of the construction, the developer shall obtain a Final Inspection Approval. The Final Inspection Approval is issued by the Building Office after fulfilment of the criteria set for the building by the Building Act, Building Permit and other stipulated criteria, e.g. environmental and health protection, fire protection, etc. Operating a construction is possible only after obtaining relevant environmental permits. The Czech real estate market is undergoing a dynamic activity nowadays, which is characterised, in particular, by high demand and low supply in all segments that keeps the prices increasing. Buildings cannot be transferred independently from the land (principle “superficies solo cedit”). This applies to the buildings constructed after 1 January 2014 and to the buildings which had the same owner as the land under the building on 31 December 2013. Real estate is typically acquired via direct purchase (asset deal) or acquisition of shares in the company holding the real estate (share deal).